It was an intense Tuesday morning for the ladies of Lindy & Grundy Local, Pastured, & Organic Meats yesterday as they worked in overdrive in preparation for their grand opening. 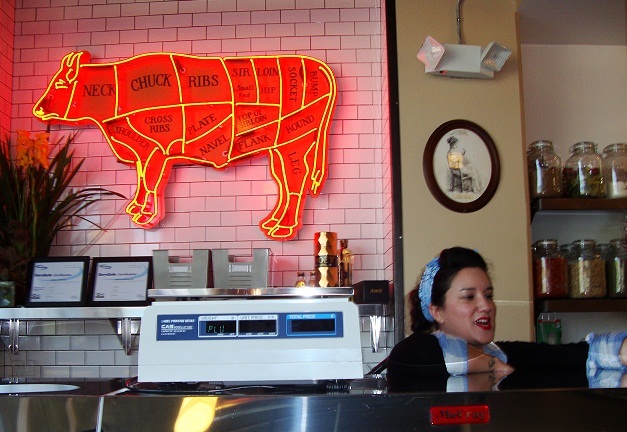 Falling behind schedule a couple of weeks ago because of some red tape with the fire marshall, lady butchers Amelia Posada (Lindy) and wife Erika Nakamura (Grundy) had quite a following behind them; eagerly awaiting the day they finally opened up shop. Luckily for me, I was working from my “mobile office” aka: tooling around the internet at Coffee Commissary working on things, so the wait from 11am to noon to 1pm to 2pm went by quickly and I didn’t mind it at all. You can find more information about Lindy & Grundy here and follow them on Facebook, too!